Both before the market's October sell-off and in the two-week bounce, investors have shown a clear preference for "quality" stocks. Not the same as cheap "value" stocks, these are companies with less debt, stable businesses and some defensive characteristics in a tougher market or economy. A grouping of such companies by Citi surfaced the likes of Walmart, McDonald's, Pfizer, Procter & Gamble, Amgen and Quest Diagnostics. While not predictive in itself, this pattern is one seen in the run-up to a bear market. "Own only high-quality stocks" is one of those investment maxims that always sounds smart but only sometimes works well. This seems to be one of those times. Shares of quality companies have been outperforming the broad benchmarks — both before the October market correction and on the bounce of the past two weeks. As a characteristic of companies — a "style factor" for selecting stocks, in the industry jargon — quality has no single, strict definition. But the common traits are a sturdy business not reliant on a strong economy; high and resilient profitability; and a strong balance sheet unburdened by much debt. There are several exchange-traded funds built to isolate quality stocks, such as the Invesco S&P 500 Quality (SPHQ), which selects S&P 500 stocks highly ranked by return on equity, better-quality cash earnings and low financial leverage. It captures a lot of stable growth companies, with 35 percent of the fund in tech, 15 percent consumer staples and only token helpings of energy and financials. 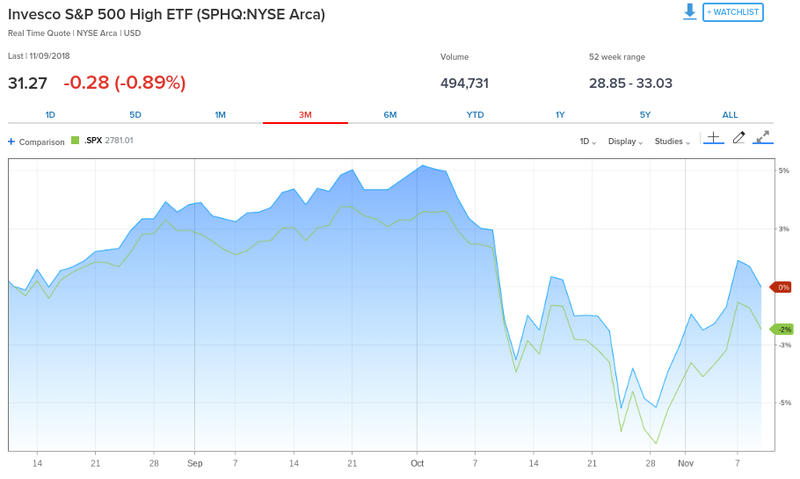 This ETF started outperforming the S&P 500 a few months ago, and since August has led by 1 percentage point. 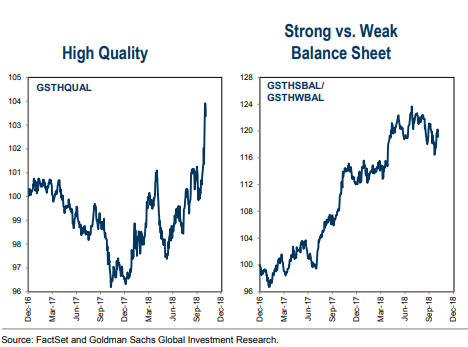 Goldman Sachs' equity strategy group maintains stock baskets filtered for quality and strong balance sheets, which also have performed well, with the quality strategy soaring relative to the market lately. Many professional investors have been calling for some time for a rotation from expensive growth stocks to cheaper value stocks. But quality, as an attribute, isn't the same as value; the value indexes are full of highly cyclical, heavily indebted boom-bust companies. Quality has a lot more overlap with defensive stocks. Health care is the best-performing sector in the S&P 500 this year, up more than 12 percent and is among the groups most heavily weighted in quality companies. So what does it mean that all-weather, more-defensive stocks are gaining favor in a time of strong domestic economic activity and with collective corporate profits surging by more than 20 percent this year? It fits with a market sensing the economic cycle is in a later phase, for one thing. Mixed signals about how strong the economy, in the U.S. and abroad, can stay next year even as the Federal Reserve slates a few more rate increases, sends investors toward steadier companies. A record volume of debt has accumulated on the corporate sector, and rising interest rates will stress over-leveraged companies. 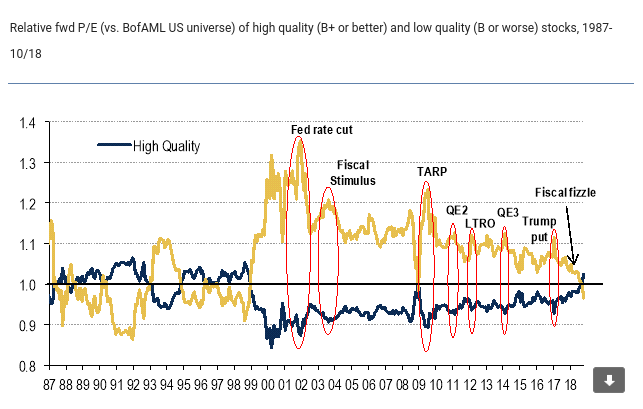 Bank of America Merrill Lynch shows that quality stocks now trade at a valuation premium to low-quality ones for the first time in nearly two decades, and ties the shift to a withdrawal of liquidity that has helped to float riskier businesses. And a more jumpy, anxious equity environment — with two separate 10 percent corrections within the past nine months — works to the benefit of quality names, too. "Investors need to think about more volatility and a quality bias in portfolios," Citigroup strategist Tobias Levkovich told clients last week, adding that the firm's leading volatility indicator "suggests a bumpier path for stocks in the next 18 months, while elevated interest rates could require investors to skew portfolios toward names with better-quality balance sheets and stronger debt ratings." The sobering inference from the ascendant quality trade is that it's consistent with a market girding for tougher times, While not predictive in itself, this pattern is one seen in the run-up to a bear market. As noted here before, one skeptical take is to observe just how much seemingly great news — 20 percent earnings growth, a huge corporate tax cut, close to $1 trillion in share buybacks — has been thrown at this market, only to nudge the S&P 500 up 4 percent for 2018. While it typically takes a recession to bring about a truly damaging bear market, some market watchers have called the past several months a rolling, global bear market — first taking down emerging markets stocks, foreign banks, housing stocks and small-caps. So are quality stocks simply helping to carry the indexes through a rough patch that's almost over, or is their strength the market's way of preparing to ride out a tough winter?